A black hole and a blank canvas for the Moon to shine. 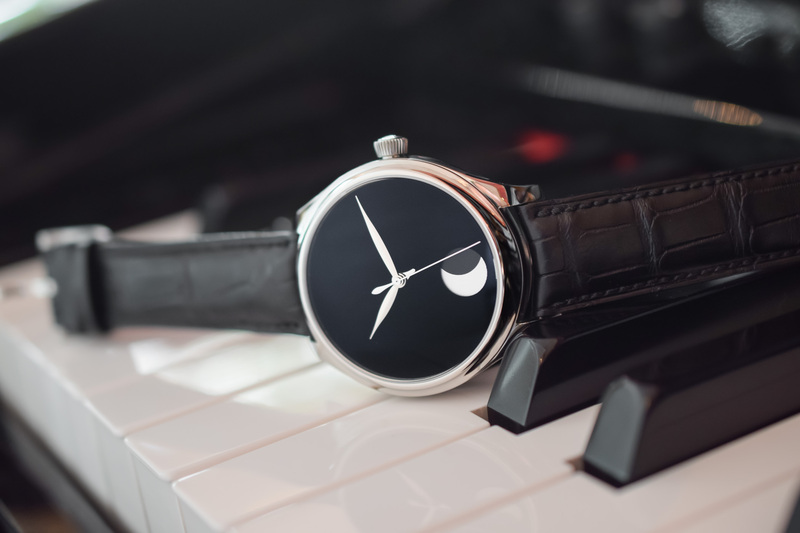 The Endeavour Perpetual Moon Concept consolidates superlatives as one of the most precise, one of the most spartan, and certainly the darkest moon phase watch on the market today. 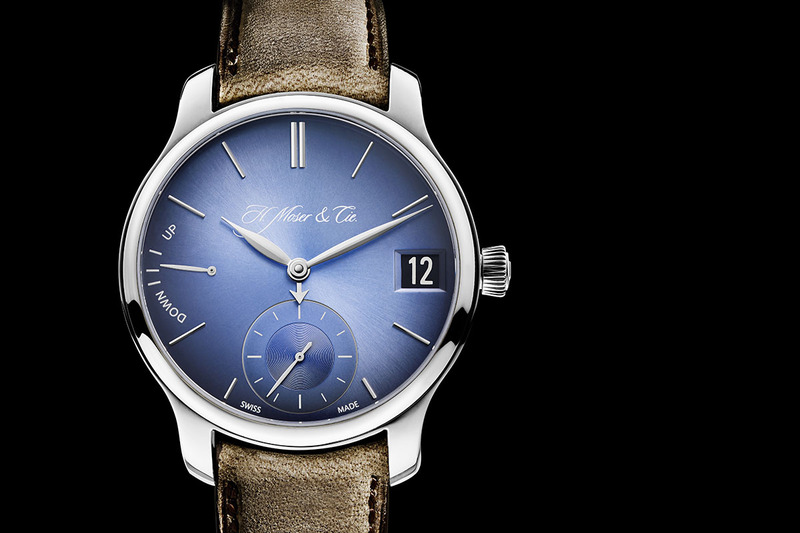 Presented in two versions – one in red gold with a signature Moser fumé dial and another in steel with a pitch-black dial – the steel model is the talking piece. With a dial made from Vantablack – the darkest, blackest synthetic substance on our planet – a dramatic black hole canvas serves as a stage for the Moon to perform its orbit. Alluring and mysterious, Vantablack brings the alien sensation of a black hole one step closer to earthlings. (Recommended music while reading this article: Muse, Supermassive Black Hole). The use of materials borrowed from aerospace and high-tech industries is becoming more and more habitual in watchmaking, endowing watches with enhanced physical properties and a defiantly contemporary look. 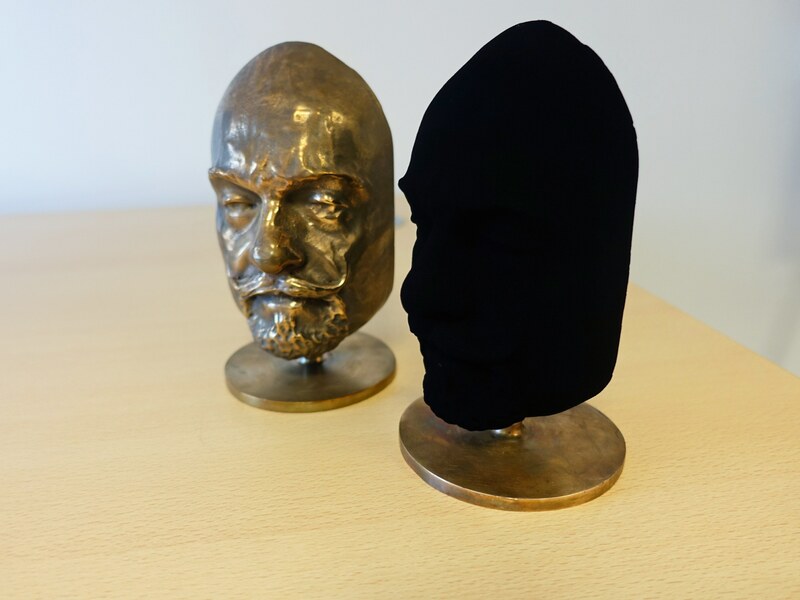 Vantablack is the darkest artificial substance on Earth capable of absorbing up to 99.975% of radiation in the visible spectrum (you can read all about it here on Wikipedia). Developed and patented by Surrey NanoSystems Limited, Vantablack (vertically aligned nanotube arrays + black) is a nanotube-based pigment. Functioning like a black hole, when light strikes Vantablack it is trapped, deflected and absorbed among the forest of billions and billions of nanotubes. 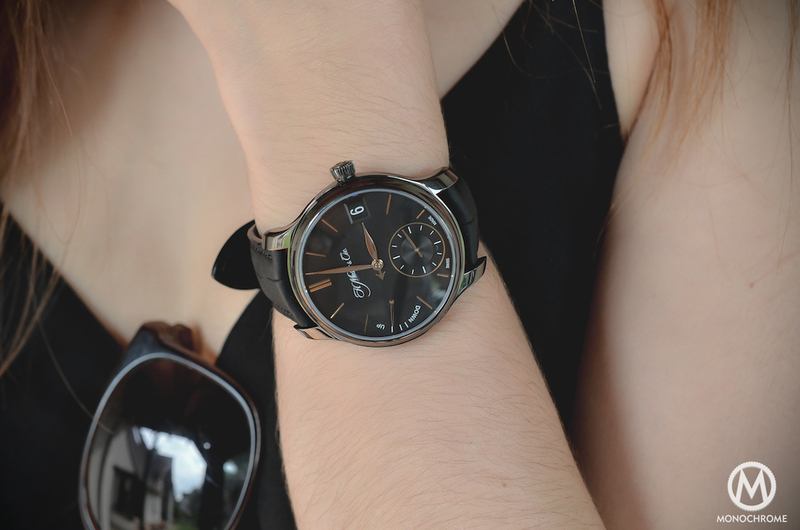 Used in aerospace and defence sectors (telescopes, infrared cameras, thermal camouflage) the story of how the blackest of blacks made it into the watch world has a colourful history. As an artist/sculptor whose work revolves around light reflection, voids and negative space, Sir Anish Kapoor was fascinated by the properties of Vantablack and managed to secure an exclusive license with the company to use Vantablack for his personal artistic use. Although other artists have protested against this artistic monopoly (described in this fun article on Wired), Kapoor is the only artist to date allowed to use Vantablack. Two years ago, the avant-garde watch brand MCT invited Kapoor to collaborate on the S110 Evo Vantablack, the first watch to feature a Vantablack dial – and, we have to admit, to stunning effect. Moser acknowledges no collaboration whatsoever with Kapoor. 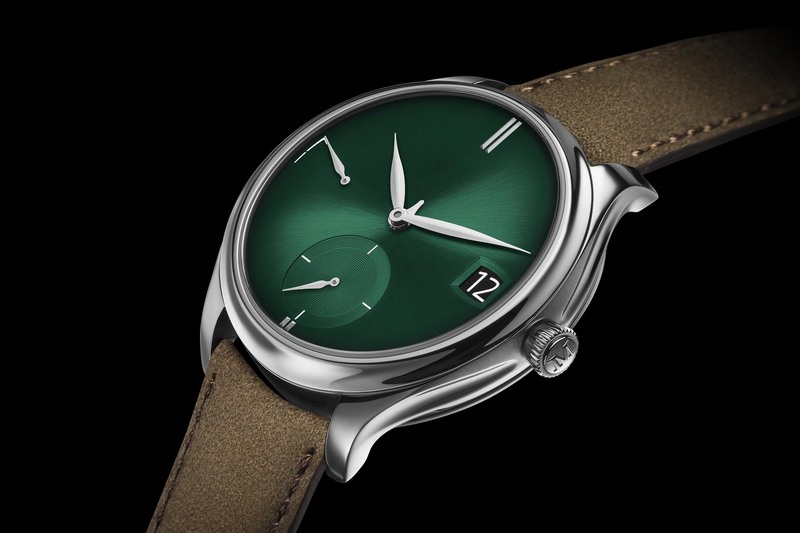 Because the watch is not an artistic product per se (some might beg to differ), Moser was able to procure the material for its watchmaking project. For the record, Vantablack has also made its foray into architecture and was used to coat the Hyundai Pavilion of the PyeongChang Winter Olympics of 2018. Designed by British architect Asif Khan, the ‘darkest building on earth’ produced a mind-blowing architectural effect by eliminating all sense of dimension and creating an optical illusion of a window on outer space replete with twinkling stars. The Endeavour Perpetual Moon Concept is in line with Moser’s Concept watches that embrace the ‘less is more’ maxim with rigorous discipline keeping the display of the complications as unobtrusive as possible (like the radically pared-down Endeavour Perpetual Calendar). With no logo, no indices, no Swiss Made (for reasons explained here), the dial is stripped down to its bare essentials. But being Moser, the ‘concept’ appellation was also a way of parodying the conventional understanding of a ‘concept’ watch – those one-off highly elaborate technical firework pieces that rarely make it into regular production. The deliberate obliteration of any superfluous distractions on the dial really lets you concentrate on the complication at hand. 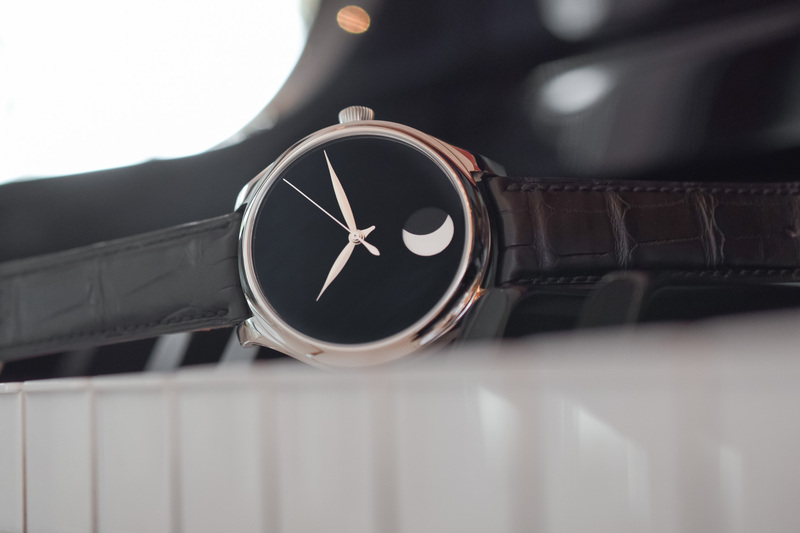 Fitted with one of the most precise moon phase complications available, with one day’s deviation every 1,027 years, the phases can be adjusted to the minute by a push-button on the side of the case. On average, the Moon’s orbital period lasts 29.53059 days. To be more precise: 29 days, 12 hours, 44 minutes and 2.9 seconds. The Endeavour Perpetual Moon Concept’s intricate wheel train portrays this interval so precisely that the gap is a mere 0.23 seconds per day, that is to say, one day’s deviation after 1027.30 years. 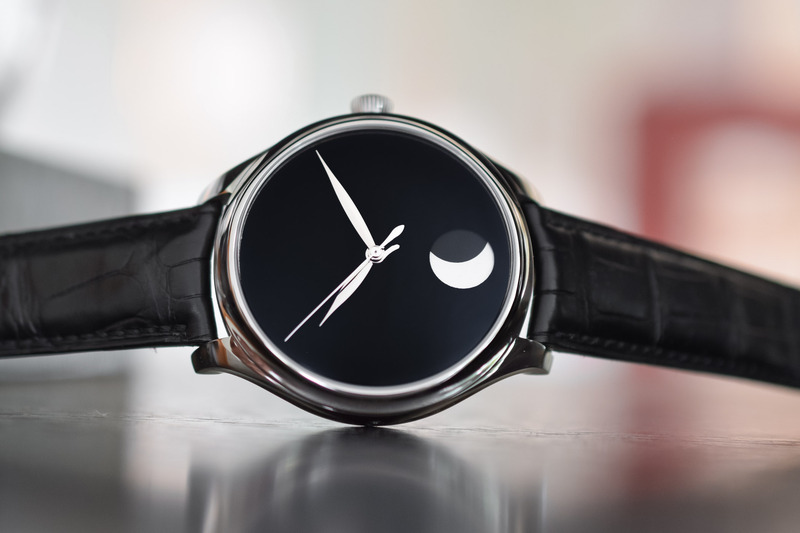 That sounds quite amazing, but we mustn’t forget that there are other watchmakers out there with even more precise moon phase complications like Andreas Strehler with his Sauterelle à Lune Perpétuelle that will deliver an accurate reading for over 2 million years and made the Guinness Book of World Records. 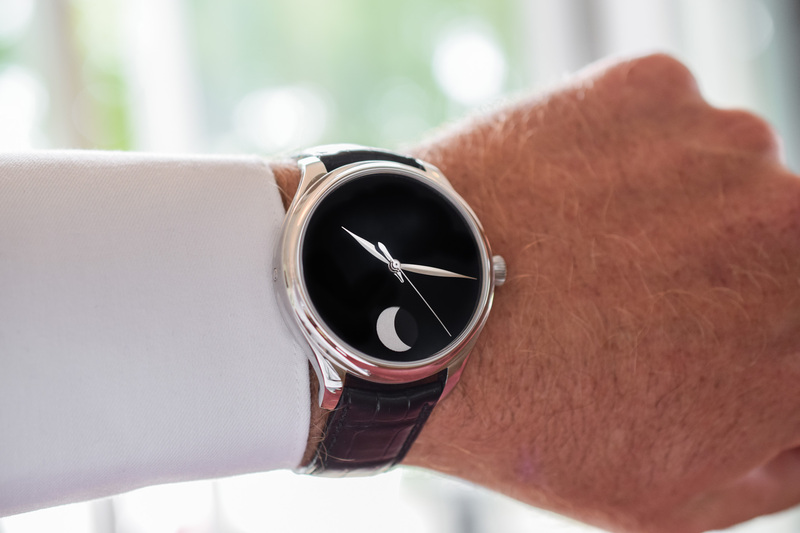 For a more in-depth look at moon phase watches and how they work, don’t miss Xavier’s article, here. The steel case measures 42mm and has a height of 12.9mm and features the attractive groove along the caseband that distinguishes the Endeavour family. Brushed and polished, the smooth rounded contours and short lugs allow the watch to sit comfortably on larger wrist sizes. The only trace of labelling is in the form of an ‘M’ on the crown. 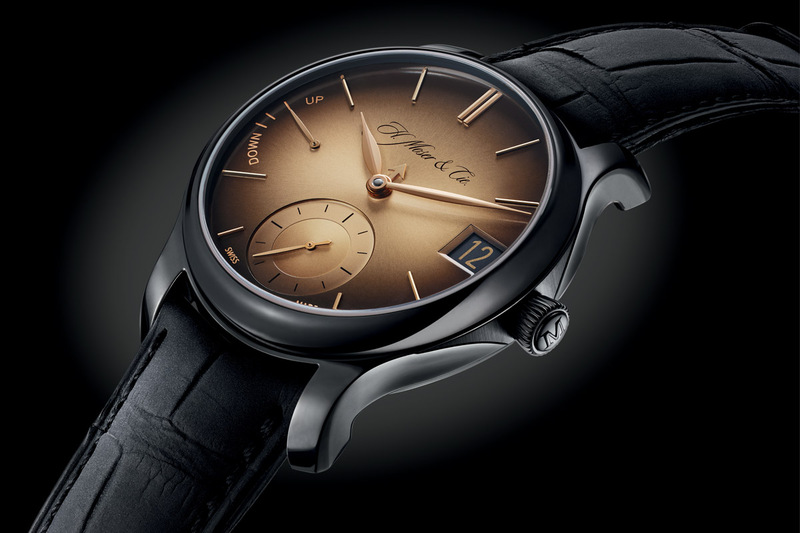 The hands are classic Moser leaf-shaped hands, and the dial is protected by a curved sapphire crystal. And this is where things get a little sticky because the curved glass generates reflections that can interfere with the black hole effect. Powered by the HMC 801 hand-wound manufacture calibre, the most ingenious part of the movement is the interchangeable modular escapement. The idea is that, like a plug, the escapement module can be easily extracted from its cage and serviced. 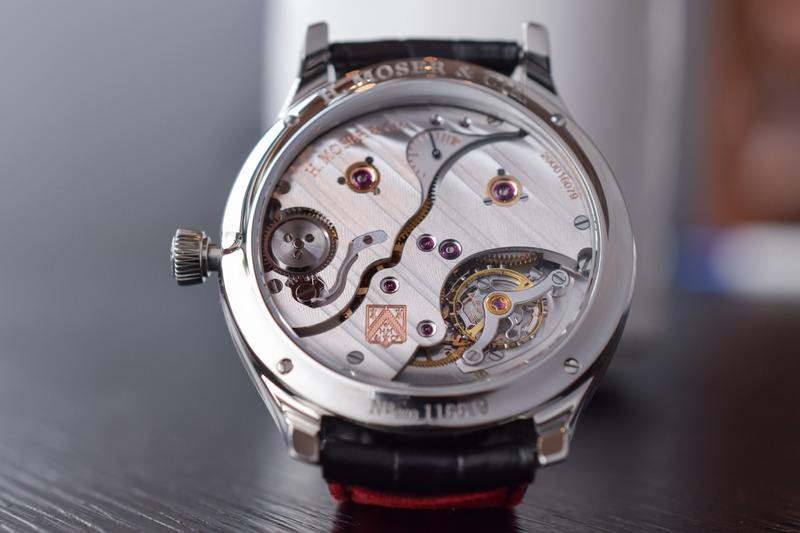 Finished to Moser’s exacting standards, parts of the movement – including Moser’s double hairspring escapement – can be admired through the exhibition caseback. To complete the picture, two barrels provide a generous 7-day power reserve. 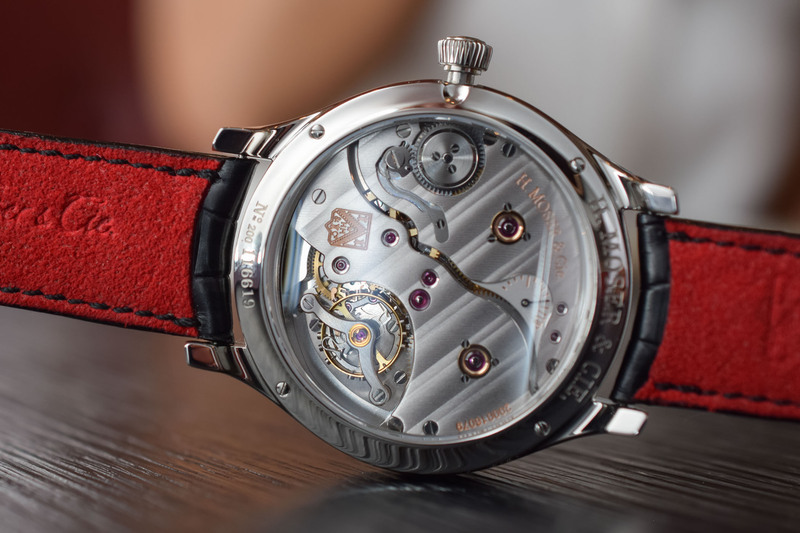 This movement displays the hours, minutes and seconds, as well as a day-and-night indicator on the central axis (via a small hand that rotates once every 24-hour). 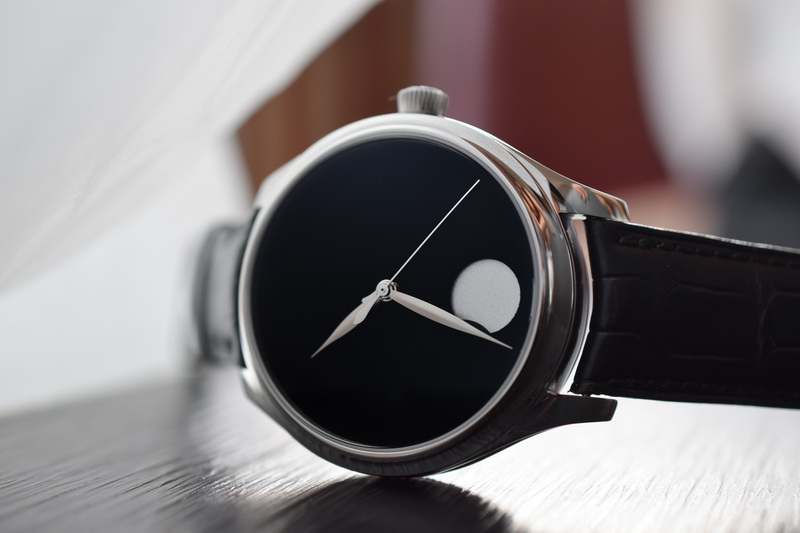 Even without a characteristic Moser fumé dial, the Endeavour Perpetual Moon Concept bears all the markings of a Moser watch by not bearing any markings at all! 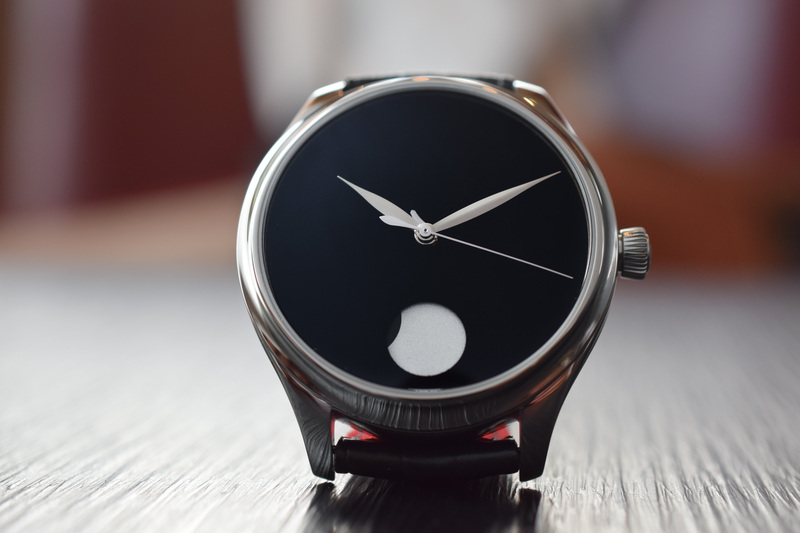 Pure, sleek and contemporary, this watch shows how cutting-edge technological materials like Vantablack can be used to create an object of astronomical beauty. 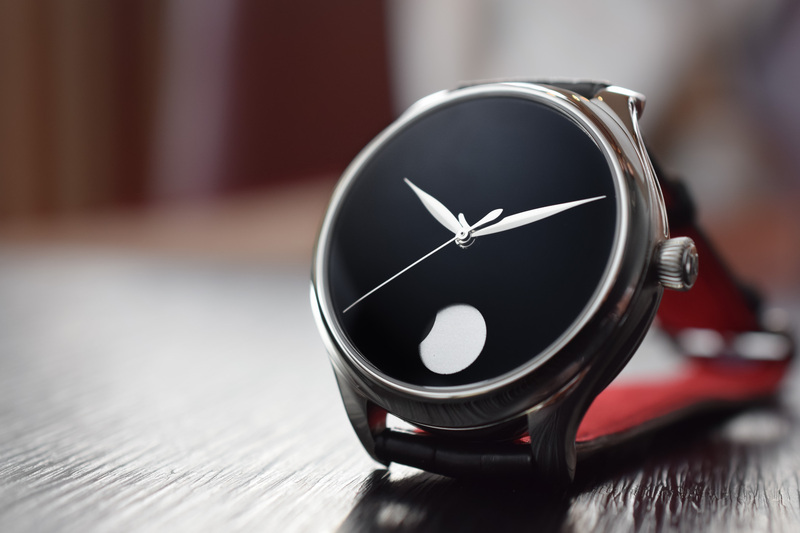 So for all the Stephen Hawkings out there – or those of you who like to meditate on the infinite dimensions of the universe or the mystery of dark energy, this might just be the watch for you. 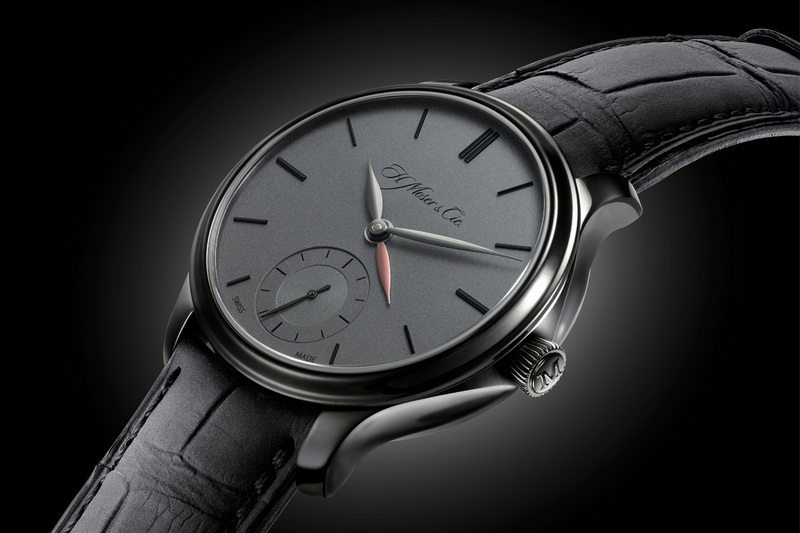 The stainless steel model with the Vantablack dial retails for CHF 35,000 (same price for the red gold model) and comes with a hand-stitched black leather strap and steel pin buckle. More information on www.h-moser.com. When I first saw this I instantly loved it; then as time passed I couldn’t get rid of thoughts of an upside-down Movado Luno Sport with black dial. Damn it. The steel version going for the same price as the gold one, though? Unless they’re making ten models in steel and forty in gold, there’s no excuse for that. If it’s a 25/25 split they can jog on. I think the cost of the vantablack makes up for the difference in cost between steel and gold case (I think the gold has the regular Moser fume dial). @Joseph Gelfand – you got the point here. The Vantablack dial is much more expensive simply because this material is extremely delicate and many of the dials are simply rejected. Also, with such low production numbers, the difference between steel and gold is less important. That’ll teach me not to skim-read or ignore the introduction for articles in the future! Sorry, Rebecca. In that case you’re absolutely right about the cost being justified, what with vantablack being an expensive material. Sometimes I’m an idiot. I see Moser have updated their website to include the new models under the current collection. Looks much better, more…complete. Pretty doesn’t have a moser double hairspring ? Does it have hacking seconds ?